Memory is often treated as a sacred set of potentially absolute meanings and stories, possessed as the heritage of a community. Memory is often owned; history, interpreted. Memory is passed down through generations; history is revised. Memory often coalesces in objects, sacred sites, and monuments; history seeks to understand contexts and the complexity of cause and effect. History asserts the authority of academic training and recognized canons of evidence; memory carries the often powerful authority of community membership and experience. Gilmer’s new play about one of the most famous African Americans in history draws on both history and cultural memory to depict Tubman as we’ve never seen her before. Whereas first-hand accounts of Tubman telling her own story use the dialect typically ascribed to illiterate slaves – “I saw de’ oberseer raisin’ up to throw an iron weight at one ob de slaves an’ dat wuz de las’ I knew” – Gilmer’s Tubman speaks with the voice of a modern leader. Whereas many accounts of Tubman’s life as a conductor on the Underground Railroad conflate historical fact with received memories without comment, Gilmer uses contemporary songs and film tropes to emphasize the fact that when we tell the story of Harriet Tubman, we are telling a story on a scale as epic as that of any ancient mythology. When the Know approached me about directing Harry, I responded with enthusiasm but also asked that every attempt be made to find a black woman to direct. Though as a journalist I have covered successful collaborations between black playwrights and white directors (see here and here), and one between a white playwright and a black director (here), I am extremely wary of co-opting the story of a black woman as told by another black woman. Many times in the history of American entertainment, the creative endeavors of African Americans have been stolen, imitated, corrupted, and otherwise used for profit by white Americans. Sometimes it’s done poorly (see my piece on Miley Cyrus at the VMAs), and sometimes it’s done with amazing artistic integrity. But even Jenji Kohan, who means well and is making a hugely important contribution to diversity in entertainment with her series Orange is the New Black, has not been able to avoid turning a story about something largely experienced by women of color and poor women into a partial regurgitation of the lie of the rich, white savior. In Harry and the Thief, there is no white savior. 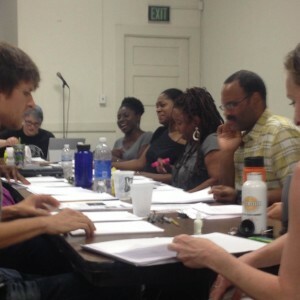 In fact, there are only two white characters, and though their arcs are fascinating and integral to the play, this is story about fugitive slaves, about contemporary black men and women grappling with the ongoing legacy of slavery in American culture, and about the malleability of history, especially when it comes to the disenfranchised. As a director, I often describe what I do as translation. I translate writing on the page into action on the stage. I translate actor impulses into narrative structures. I translate history and memory into stories being told right here, right now, right in front of the audience. My hope with this production is that I can serve primarily as a translator for the epic myth of Harriet Tubman, for Gilmer’s voice, and for the memories and thoughts and feelings of the actors embodying these characters. Because I can read about the history of slavery and the Underground Railroad, I can read about modern-day discrimination, and I can imagine myself walking in the shoes of a person who experienced/s that. But I cannot remember it. It is becoming increasingly clear that the hegemony of isolationism is not a solution to our present global circumstances. Our understanding of action and responsibility is changing. We know that our tiniest gestures have large-scale effects, as do the outward ripples of a pebble thrown into a pond. In moments such as these, of upheaval and change, stories become necessary to frame our experiences. … From their ancient origins and continuing through today, stories bind societies by reinforcing common values and strengthening the ties of a shared culture. But they do more than that. Stories give order and meaning to existence and are less costly than direct experience because with stories it is possible to collect information without having to personally undergo the experience. … In the theater we construct journeys for audiences utilizing the tools of time and space. An effective production communicates in ways that infiltrate the audience in multiple layers, weaving details and scenes, narration, imagery, symbolic action, plot and character. We create societies, tell stories, and propose means by which people can live together with increased humanity, empathy, and humor. 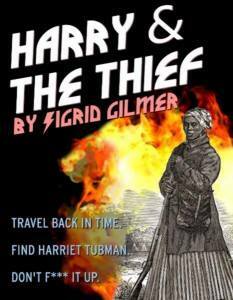 Sigrid Gilmer’s Harry and the Thief not only provides a new version of the Tubman myth, it also endows that myth with the possibility of engendering even more dramatic social change. I can’t wait to get started translating this play into a production that can provide audiences with the opportunity to dream and imagine a future on a scale as grand as Gilmer’s fictional one.